If you are on the fence about watching Syfy’s new, um, sci-fi show Defiance, you can now preview the first 14 minutes of the series to see if its whetting your fan whistle. 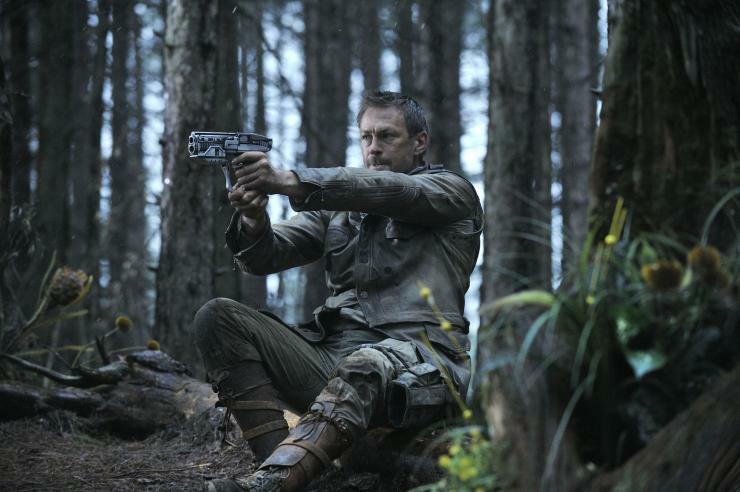 The April 15 premiere of Defiance will mark the culmination of a long journey for the network. The show will share a universe with a MMO videogame of the same name, launching April 2. Set 33 years in the future, humans and aliens have to co-exist after an alien invasion. The aliens are called Votans, a collection of seven species from the same solar system looking for a new home after their solar system was obliterated. Since Earth didn’t welcome them, they decided to start a war which led to near mutual human-alien extinction, the fall of most governments and a planet radically altered due to a terraforming tech. To ensure survival, some towns have emerged where aliens and humans have an unsteady alliance. Such a town on the show is Defiance aka St. Louis, MO. In the game, the player will instead be hanging out in San Francisco, so the player won't impact the show. This is a big move, and a big gamble for Syfy. They've put a lot of money into it, and a lot of network execs will be either joyous or very bummed out by end of day, April 16. So it is no surprise that Syfy wants to put everything in its favor as possible. To wit, they've released the first 14 minutes of the show to lure fans into their world. The series premieres April 15 at 9 p.m. ET and stars Grant Bowler, Stephanie Leonidas, and Julie Benz.